· Kimmeridge Limestone 4 (“KL4”) EWT operations now underway. Further updates to follow in due course following flow stabilisation and pressure build up (“PBU”) tests. · Final Xodus report determines that the single HH-1 well “sees” a connected Portland oil in place (“OIP”) of approximately 7-11 million barrels, a robustly viable commercial volume for a single well. · Horse Hill Portland and Kimmeridge long-term production scoping report submitted to Surrey County Council (“SCC”). Overall plan includes a total of six production wells, with up to 3 production wells and a reservoir pressure support well in the Portland oil pool. A planning application for production will be submitted to SCC prior to the completion of the 2018 EWT programme. 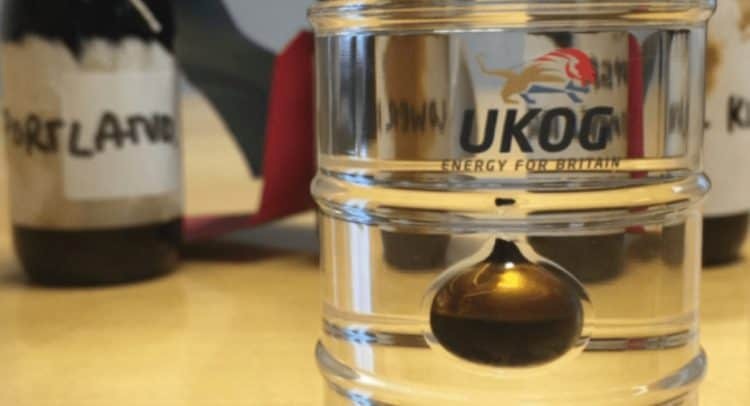 UK Oil & Gas PLC (London AIM: UKOG) announces that HHDL, a UKOG subsidiary company and the operator of the HH-1 Kimmeridge Limestone and conventional Portland Sandstone oil discovery, has informed the Company that, following the successful Portland EWT programme, the KL4 EWT flow sequence operation has now commenced. HH-1 is located in licence PEDL137 in which UKOG holds a 46.735% beneficial interest. Further to the reported Portland EWT results, Xodus have now delivered a report which details that, to date, the single HH-1 well has “seen” approximately 7-11 million connected barrels of the total full field OIP (or Stock Tank Oil Initially in Place “STOIIP”) reported in the Company’s July 2018 AIM re-admission document. Based upon modelled production profiles and oil recoveries, the Company and Xodus believe this to be a commercial connected OIP volume for a single well that supports the Company’s envisaged multi-well Portland oil drilling and production programme. It should be noted that the calculated connected OIP should not be misconstrued as recoverable volumes or reserves. Given the EWT has delivered both commercially viable Portland flow rates and connected oil volumes, an internal declaration of Portland commerciality will be made shortly by HDDL. As the first part of the regulatory process necessary to deliver the Company’s goal of long-term oil production at Horse Hill in 2019, HHDL has recently submitted an outline production scoping report to SCC. The scoping report details the envisaged environmental impacts from the outline development’s future drilling, production, decommissioning and site restoration phases. The envisaged development has a total of six production wells and assumes a maximum daily rate of around 3,500 bopd. During the production phase it is envisaged that should production capacity exceed 3,500 bopd an application to increase total produced volumes will be made. The Portland oil pool is envisaged to be produced via up to three wells and one pressure support well. As previously reported, regulatory permissions are in place to drill and flow test the first two new wellbores, HH-1z and HH-2 with a planned early 2019 spud date. The scoping report and a table of estimated HGV movements during the production phase is available on the Company’s website. Average HGV movements during the plan’s 20-year field production life are estimated to total three per day. Following SCC’s feedback on the scoping report, HHDL will then submit a full-scale production planning application, currently planned before the completion of the current 2018 EWT programme.